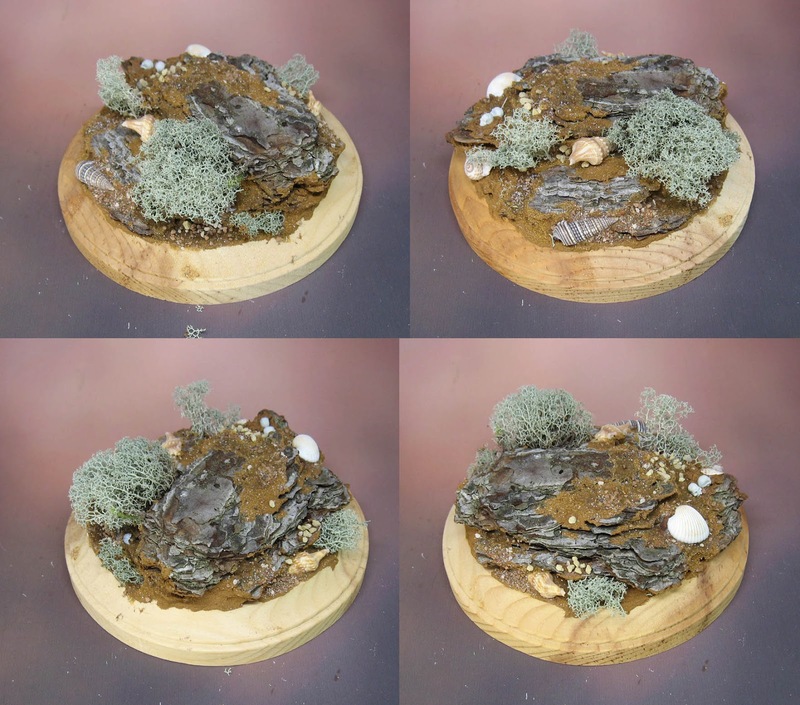 By now, most of you are familiar with the Bark and Branch method of basing, using things like Oxide Paste, wood glue and tree bark to create some very nice rocky/forest style bases. 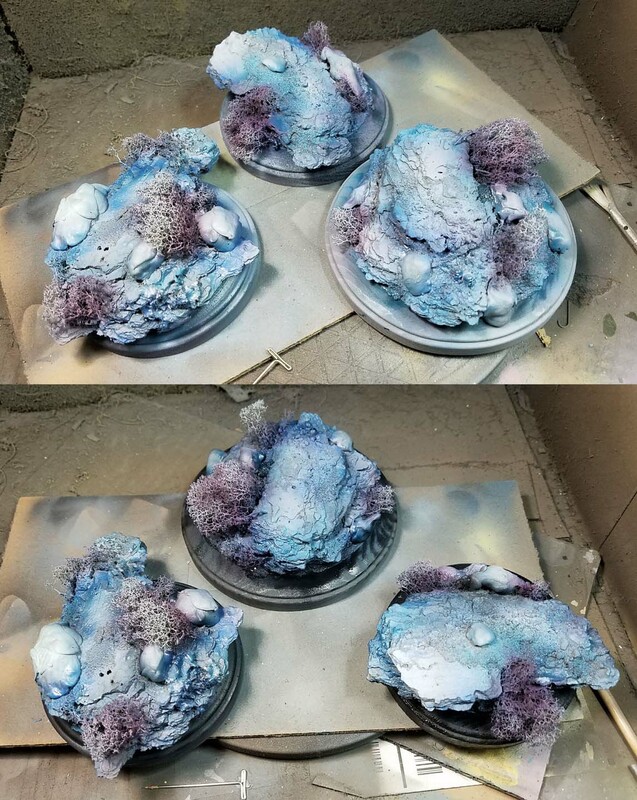 I needed to put a twist on that type of basing technique in order to base some very unusual sea creatures. These are fairly large, so I built these bases up from wooden plaques. 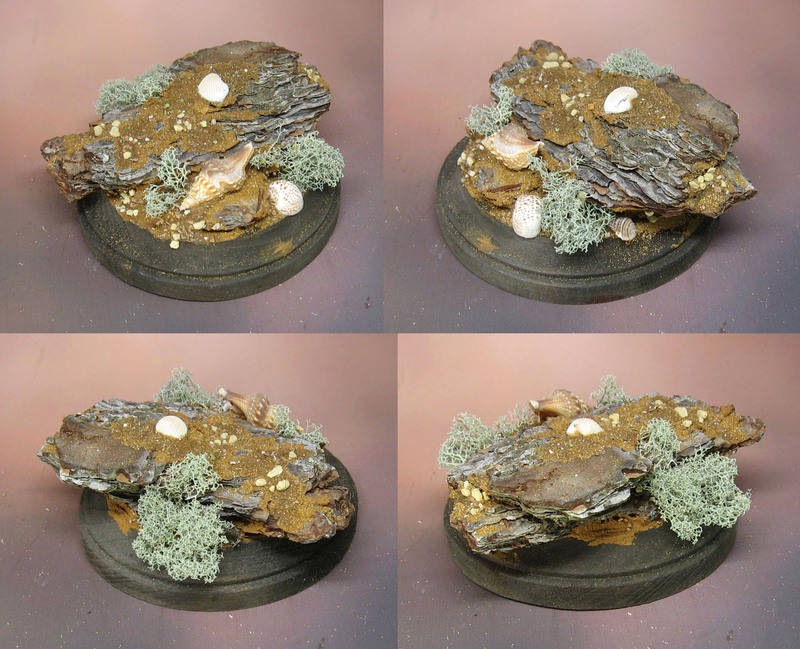 The first things you will probably notice are the sea shells (which I have used before on some smaller bases), but now I am trying out some dried moss to see how that will match up to coral at this scale! This is an example of one of the creatures. 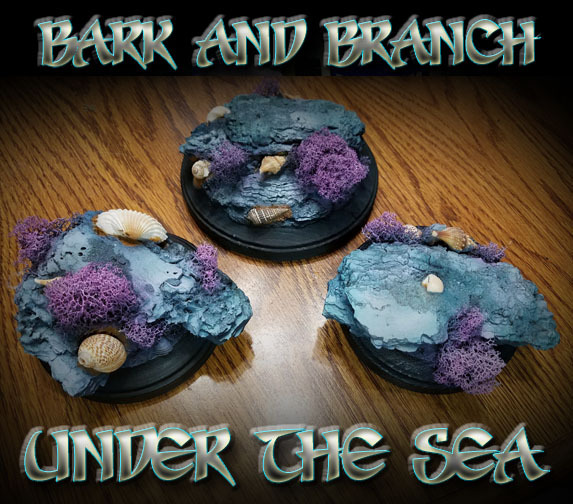 They are combinations of land and sea critters, and certainly have a certain look about them! These also provided me with an excellent chance to try out the new lower pressures of the airbrush. Masking off the shells took a little while, but certainly worth it. I started out with a number of grays and greenish hues, using the Badger Stynlrez primers. 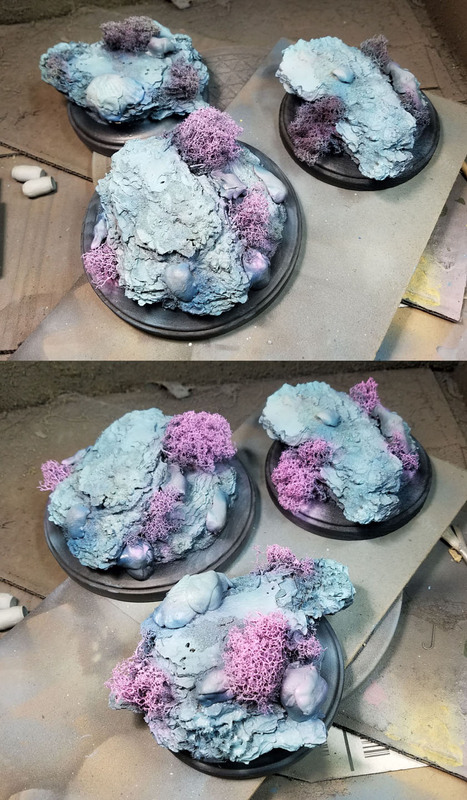 I used a number of the Ghost tints on these bases, especially on the moss/coral. I went back and forth with more darks, blues, grays, and then back to lighter tones. 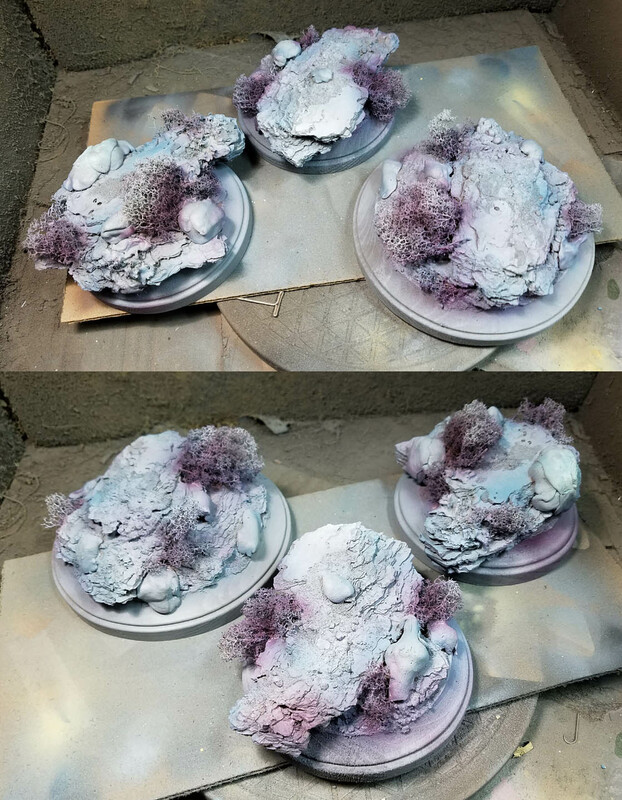 Since these were pretty large bases (and quite rough in texture) I wanted to get into as many tough areas as possible with the airbrush. Those new pressure settings were definitely allowing me to work in a more trasnparent fashion than usual. I think I had it set as low as 10 PSI, which is shocking for me! The Ghost Tints are so thin, they can certainly get through the brush with no problem. When mixed with the primers, you get an intense color which is also going to adhere well! Plus, all these layers of primer and color would serve as a very nice sealer for all the wood and moss. I removed the masking material from the sea shells, and it was quite a nice surprise! 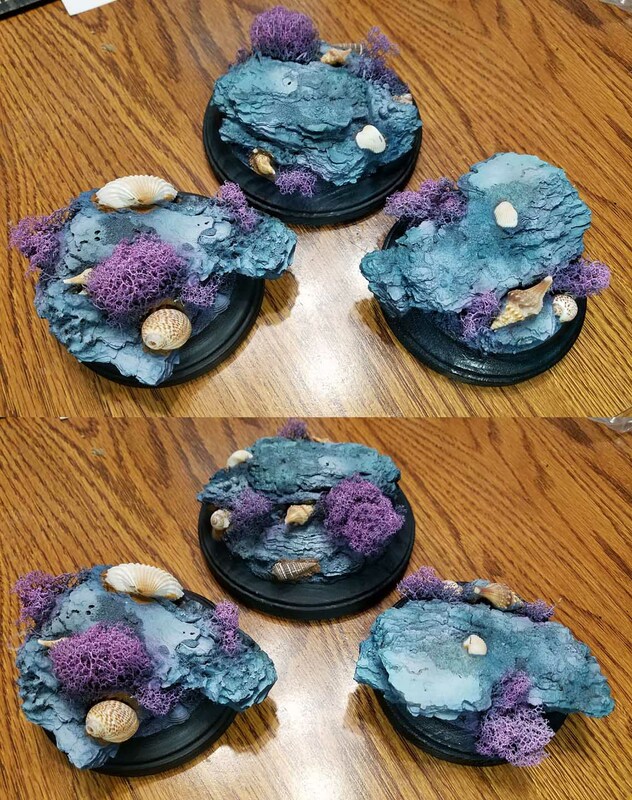 As I completed each of the figures that are meant to stand on these bases, I did more finished work to tone down those shells. Also, I added some more specific shading and highlights to the rocky sections. Now for a sneak peek at the completed BatShark!